The body needs both types of iodine/iodide to be protected and truly healthy and now with vitamin “C” for greater absorption into the cells. We know you will love what this product will do for you!! Please call us or email us with your testimonial. 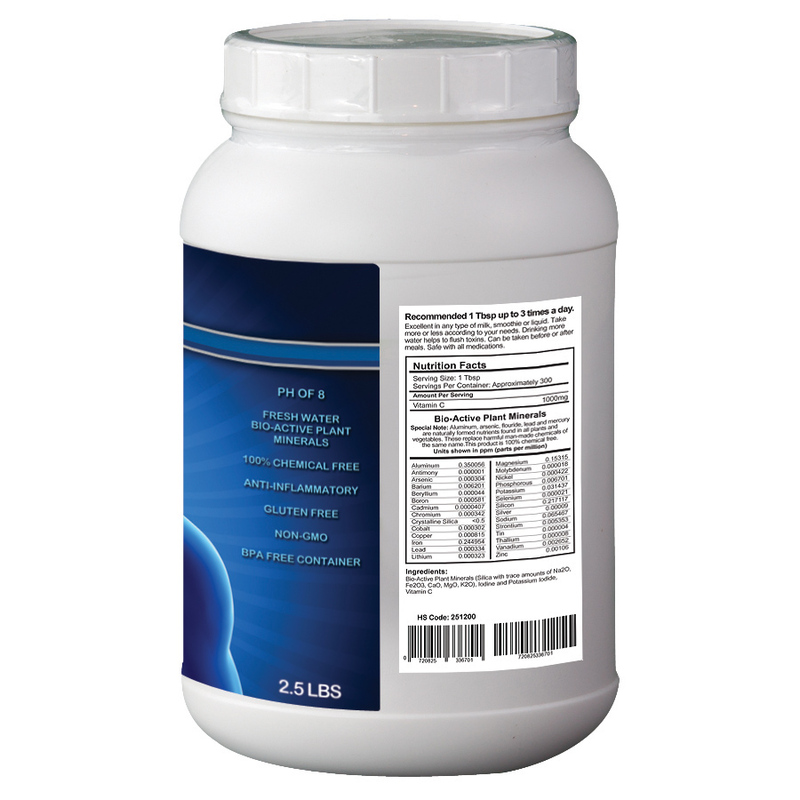 Our dosage rate per serving is 20.6 mg per Tbsp. of Iodine/Iodide with 1000 mg of Vitamin C per Tbsp. We recommend three servings a day adding up to 62 mg of Iodine/Iodide and 3,000 mg of Vitamin “C” for a healthy and fit body. 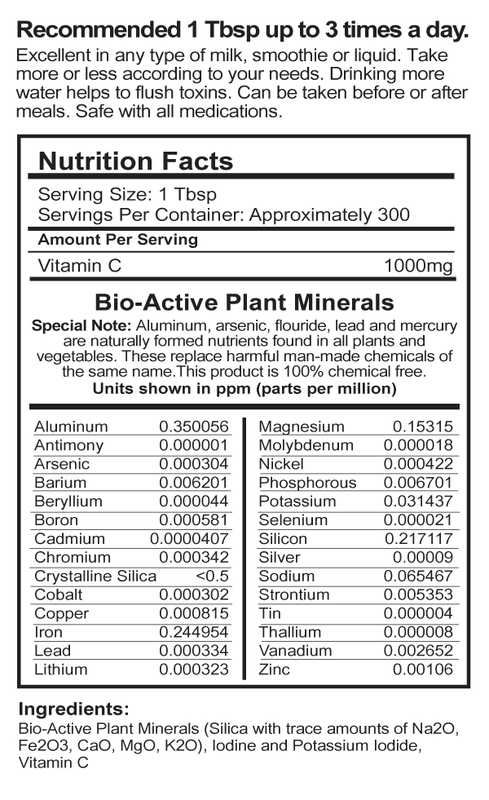 We use a powdered anhydrous formulation of (hydrodine) Iodine along with Potassium Iodide with Vitamin “C” also infused with it is our bio-active aerobic rare earth nutrient powder. Iodine deficiency is the underlying problem responsible for many diseases and for the high rate of cancer, (particularly breast, lung, prostate and ovary) including diabetes, heart disease, autism, emphysema, asthma, infertility, stillbirths, SIDS, ADD, ADHD, retardation, morbid obesity, thyroid issues, goiter, acne, virus, fungus, bacteria, parasites, multiple sclerosis, mental clarity, hormone issues of all types, allergies, oxidation, cold hands, numbing of extremities, low IQ, migraine headaches, fibromyalgia and it allows the body to sweat and is a key factor in detoxification through the skin. People are also being increasingly exposed to environmental toxins that block the action of iodine. These include fluoride, chlorine, bromine (and bromates) and perchlorates. These chemicals can persist in the environment (and in our bodies) long after exposure to them has stopped. Iodine helps to rid the body of these dangerous toxins. From a larger physiological perspective is that most doctors concentrate on just the thyroid gland and it is important to realize that the thyroid is only one gland of many glands and tissues that desperately need iodine. Other glands/organs/systems with high iodine uptake are the breasts, ovaries, cervix, blood, lymph, bones, gastric mucosal, salivary, adrenal, prostate, colon, thymus, lungs, bladder, kidney, and skin. 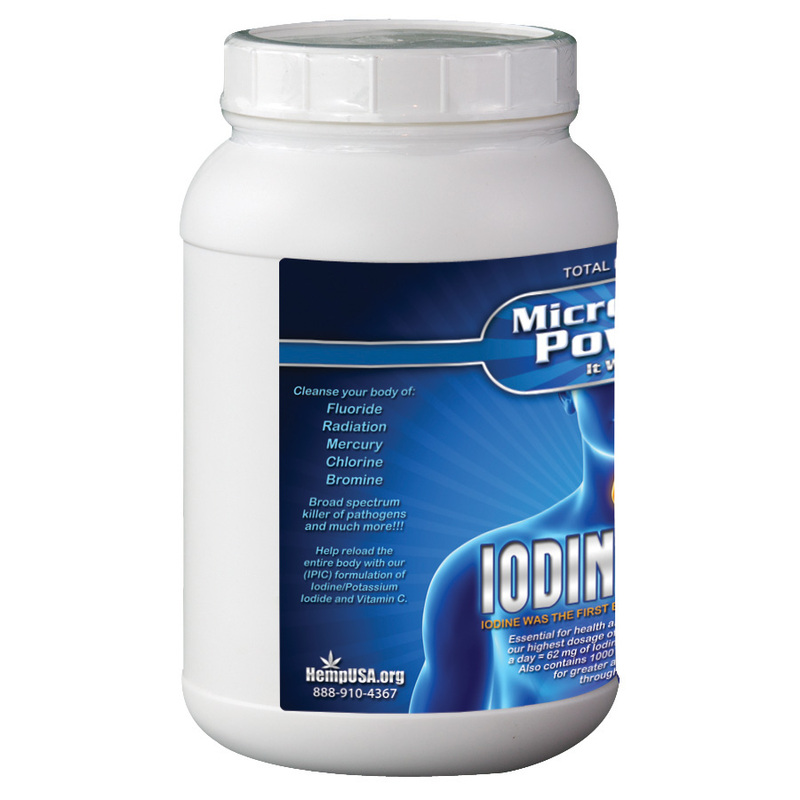 The recommended dosage in the U.S. for iodine is only 150 micrograms (1 milligram is 1000 micrograms). However Japanese consume much larger doses of iodine because of the seafood they eat. This nation is known for extremely low cancer rates and low thyroid function problems. The Japanese, for your notes, consume around 12.5 milligrams of iodine a day. 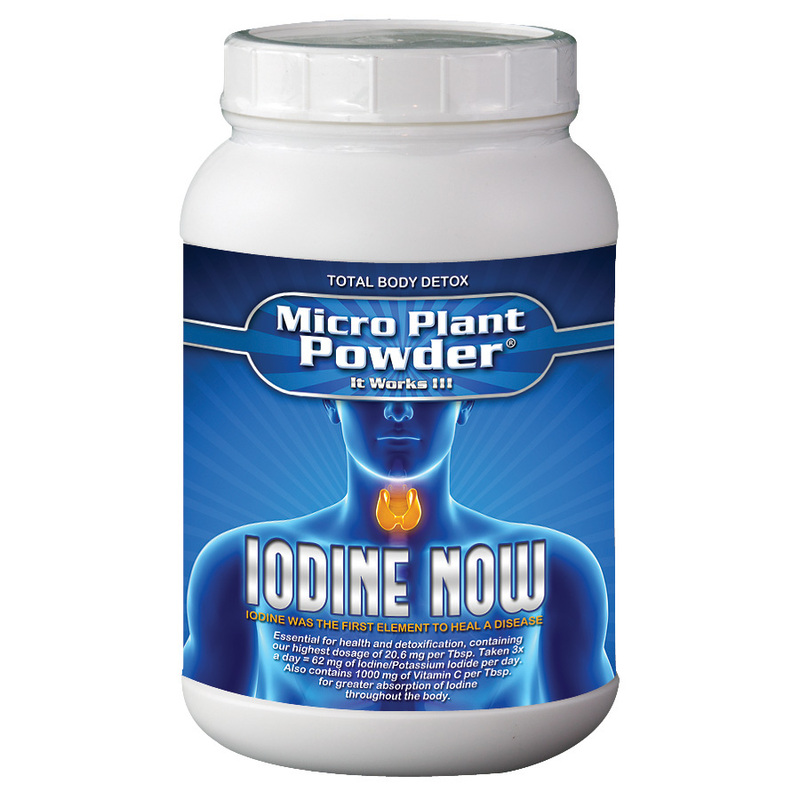 Iodine helps the body flush out toxins, radiation, halides and heavy metals from the body. Iodine is so important for our body that every cell within our body uses it in some way. Then why is only 150 micrograms, the recommended dosage for iodine? Iodine helps generate new cells within our body and at the same time getting rid of the old ones. Also white blood cells are incapable of guarding the body against infections without an appropriate amount of iodine. The cholesterol in the blood is reduced when consuming an appropriate amount of iodine. A lack of iodine during pregnancy may lead to children having ADD or low IQ, retardation and deformities and stillbirths. The body can hold up to 1500 Mg of Iodine and 3% of the total iodine is stored in the thyroid gland to produce thyroxin. Not enough of iodine may cause thyroid dysfunctions such as goiter. The thyroid gland is one of the largest endocrine gland which is found in the neck. It forms the adams apple in the necks of some people. The thyroid gland controls how quickly the body uses energy, makes proteins, and controls how sensitive the body is to other hormones. It participates in these processes by producing thyroid hormones. These hormones regulate the rate of metabolism and affect the growth and rate of function of many other systems in the body. These hormones are synthesized from both iodine and tyrosine. The thyroid also produces calcitonin, which plays a role in calcium homeostasis. As you may conclude from this citation by the number of important thyroid gland functions and a healthy thyroid gland is essential for a healthy body. Iodine was known as a universal medicine a long time ago and was the first element to heal a disease. However in 1960′s it was replaced with antibiotics for the treatment of infectious diseases. For lung problems iodine was replaced by bronchodilators; for the relief of cold symptoms iodine was replaced with antihistamines. And so on until iodine was almost a forgotten remedy. For flushing out all the harmful chemicals within the body some people recommend taking 50 mg of iodine a day, some claim that 100 mg is better and others claim much more. Between the years of 1850-1950 there was a worldwide study done with iodine and over 100 doctors dedicated to studying the effects of iodine on the human body all agreed that the dosage of iodine for a healthy human body worldwide would be 62 Milligrams per day. That is the reason we decided on this amount and with all the background study that was done we felt it was a correct dosage for the body to be healthy and fit and to protect itself from radiation and heavy metals and to load the body with our iodine/iodide vitamin C formulation and to protect and secure the body from the other competing halogens like fluoride, chlorine, and bromine. Do you know those very small red spots people get on their chests, arms and thighs that doctors have no explanation for? They are called cherry angiomas and they are caused by bromine toxicity and iodine deficiency. The capillary blood vessels break and these small red spots appear. There’s only one reliable way to flush out this toxin called bromine and that’s through consuming foods that have iodine or by consuming iodine directly with our new formulation called IODINE NOW™ and your body will replace bromine with iodine thus restoring its natural balance. It’s sad to know that we are consuming less and less iodine foods and more foods containing bromine. You can choose to consume a product called IODINE NOW™ in powder form with Vitamin C and it will purge bromine out of your body. When you take iodine directly, you are likely to see the decrease and the eventual disappearance of those little blood spots on your skin called cherry angiomas. You are also likely to see a big improvement in your overall health while decreasing the risk of many diseases such as cancer. Bromine is added to processed food to increase its shelf life. It’s a chemical element found in processed foods. These non-food items, if they contain bromine, spread toxic bromine dust into the environment. A lot of the non-edible bromine-containing items were made available since the 1970s. Bromine at that time was especially added to protect items from catching fire. Of course no proper research has been done linking bromine with cherry angiomas. Big institutions would not conduct such a research because there’s much profit in keeping this toxic substance in the food and other items. There were only small scale researches done such as the one conducted by Drs. A. D. Cohena, E. Cagnanob, and D. A. Vardya. It showed the correlation between bromine poisoning and cherry angiomas. In 1999 the Center for Science in the Public Interest petitioned the FDA to prohibit the use of bromine. It was known for a long time that bromine causes cancer in lab animals. In September 2007, the US FDA responded to Breast Cancer Choices inquiry with the statement “Potassium Bromate is still listed as a safe additive”. Bromine suppresses the sexual drive (talking about population control!) and can cause cancer. What’s worse, bromine is similar to the structure of iodine, and the body can confuse these two and start storing bromine instead of iodine. In addition to this, bromine prevents iodine absorption into the body. Bromine is also known as endocrine disrupter and neurotoxin. It promotes goiter, delays puberty, causes fetal abnormalities, reduces sperm count, causes hearing troubles, effects memory and learning, alters mood and mind in general (sometimes resulting in schizophrenia), can cause a change in a person’s behavior as well as sedation. This may be the best iodine powder formula on the market hands down, I don’t go a day without it. I have been telling people about Micro Plant powder for years but sadly to many have been brainwashed by doctors and the medical establishment so they can’t think outside the box. Bible makes it crystal clear that God has provided all we need for excellent health in the pure clean natural supplements. Great product. I enjoy it. Helps detox. Everything. I have to rave about Iodine Now! I have been using it faithfully 3T a day for 7 weeks. I worked up to the full dose over a week or so. I discovered it in my quest to shrink thyroid nodules that I was to have biopsied on July 11,2016. Well I went in for the biopsy and there was no nodules large enough to biopsy! I was always cold and extremely exhausted every day. My mood has improved greatly. The coldness in my hands and feet gone. The exhaustion has subsided for the most part but I have a special needs teen who messes with my normal sleep pattern so I am accustomed to the tiredness. I firmly believe that the Iodine Now along with a few other changes and additions,(such as frankincense oil massaged on my thyroid daily) that my thyroid is on the mend and starting to function as God intended. The surgeon told me at my consultation that the nodules meant my thyroid was dying and if need be he would remove it. I told him to slow his roll and I scheduled my procedure for 5 weeks later. Perfect amount of time to shrink the nodules. I will be ordering more of the powders to add. I just started the lemon grass as it was in my cabinet from my son. So thankful for this product! Love this Product. I have recommended it to multiple people who has thyroid issues and will continue to use this product. Iodine Now works for me. Just feel really good. Use it daily. Can’t go wrong with Iodine Now! In the early 2000’s, I developed a hyper thryoid. Through research, I was able to manage it. I had also unknowingly exposed myself to some dangerous heavy metals. This meant that for every five steps I took forward, I would be pushed back three. After a few years, I discovered HempUSA and decided to purchase their original Micro Plant Powder. Through this, I was able to address the heavy-metal toxicity, making my progress far steadier. A few years later, HempUSA formulated Iodine Now, providing my thyroid with even more nourishment. The next step was to increase the detoxification amount by adding the Matrix Bio Powder. 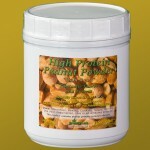 Finally, I began using the Hemp Protein Powder. By now, I’m fine tuning my nutritional and detoxification regimen, so the effects are hard to articulate. Instead, I’ll share my experience from over the summer. I am an avid cyclist. During the season, I’ll treat myself to one endurance ride (75 to 100 miles) a week, sometimes two. I had to replace my bicycle last Spring, and the new one was heavier. Because of the protein powder, my body responded by putting on muscle. After some significant car repairs, however, I could no longer afford these products. I didn’t slacken my pace and by mid August was feeling the effects of a mineral deficiency. Still in financial straits, I bought a mineral supplement I could afford. It helped, but could only provide minerals. Even after increasing my amount of rest, I just couldn’t reach my previous level of exertion. HempUSA’s products both nourish AND detoxify. In today’s world of heavy-metal toxicity, radiation exposure, and depleted soils, both are necessary. The end of the story is that my car is fixed and my finances are back on track. I recently bought some Iodine Now and began taking it, yesterday. I can already feel the ship starting to right. Once we’re past the holidays, I’ll purchase the rest of the products and resume my protocol. I’m in an off season and will be changing my exercise regimen, allowing my body to repair. Once the snows give way to Spring, though, my engines will be primed and I’ll be out of port with a full head of steam. I can hardly wait! Thank you, HempUSA, for your lovely products that address today’s dual-pronged attack on our health! Great product! Part of my daily regimen twice a day… This product really works! Here’s where it gets interesting.. While in treatment, I was doing research on products that would help me get my immune system back and fighting for me. A friend of mine told me to check-out “Hemp USA.ORG”. I did, and so my journey to kick-back to good health began. I purchased the Hemp Oil, Micro Plant Powder with Iodine, Hemp Protein Powder, and later on, I purchased Cinnamon Powder, it’s fantastic. Again, I want to tell everybody that by the “Grace of God” because of His love for me and prayers on my behalf, …He did lead me to Hemp USA.org I LOVE YOUR PRODUCTS! All of my scans and blood work have come back negative for cancer and very positive for good health……. These products really work! This product has made my mind a lot more clear since cleansing the bromine out my body and has cured my allergies , my doctor is still shocked best iodine formula hands down! EXCELLENT PRODUCT!! 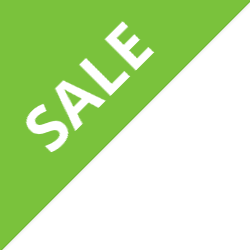 IT’S A MUST BUY…. USE THE PRODUCT FOR 3 MONTHS AND IT’S FANTASTIC!!! MANY BENEFITS AND GREAT QUALITY. THANK YOU HEMPUSA!! Please continue to bring us excellent products…. EXCELLENT PRODUCT!! 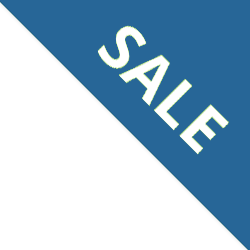 IT’S A MUST BUY…. USE THE PRODUCT FOR 3 MONTHS AND IT’S FANTASTIC!!! I just ordered my second bottle of Iodine Now. It has helped with menopause symptoms, no more night sweats and it gives me lots of energy although I am able to sleep through the night! I also take the Micro Plant Powder Gold and it has cleared up my skin and asthma related symptoms. Wonderful products, I recommend them to everyone. Thank you, Hemp USA! Within two weeks of taking the Iodine Now, the red spots that had developed over the last 5 years started clearing up. I feel great, much healthier! The Iodine Now has helped me with Hashimoto’s. I have extra energy and I am 80 yrs old. This product is a life changer it helps you in so many ways. I go to the bathroom 3 times each day now, my skin is nice and clear,my energy level has increased, I feel so good taking this product. My family and friends are taking it as well Thank you so much for this wonderful product. I just have to tell you guys again, I don’t think I’m speaking to early but, you hit a home run with this iodine now microplant powder. I have taken it already this morning as I have soccer games to drive to and have to drive the beltway. I hope I have the same results as yesterday. Thanks for EVERYTHING you all do! You are the best kept secret that I am going to continue to tell people about. I have been using Iodine now for two weeks. It’s like an over night success story. I can tell you it’s a part of my daily routine now and I don’t go a day without it!